It’s a shame that we already have the three big Grand Tours: Tour de France, Giro d’Italia, and Vuelta a España. 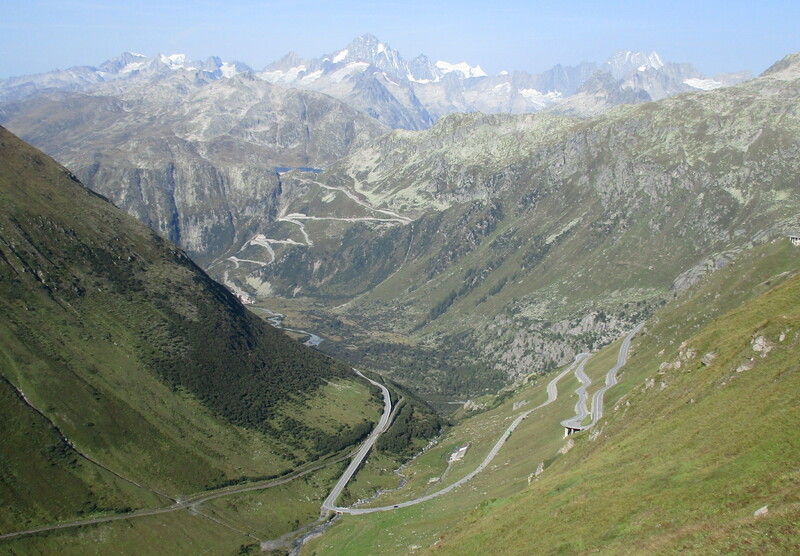 It would be amazing to have the Tour of Switzerland as a Grand Tour because there is so much staggeringly beautiful countryside and so many sensational climbs. Perhaps the country is too small to have 3 weeks of varied racing though, and then of course there’s the problem of where would it go in the schedule. But Grand Tour aside, Switzerland is well worth a visit if you like to ride your bike uphill. But don’t expect much assistance: I don’t know if all Switzerland is like the places we visited, but from what we saw the Swiss don’t go out of their way to help cyclists. Unlike France, there are no kilometer signs showing how far to the top and the gradient of the next kilometer, and the confusing St Gotthard Pass road has few signs (that I saw) to direct cyclists. Cycling Challenge’s page about cycling in Central Switzerland.